HP SN6000 Stackable 8Gb Fibre Channel Switches make Enterprise SANs affordable, manageable, and easy-to-grow as more FC ports are needed. The low-cost and high-performance SN6000 are available in single-and dual power versions and start at 12 active FC ports expandable to 20. Easily add new FC ports and switches for up to 120 usable device ports per stack (single manageable unit), or 500+ ports in multi-stack topologies. 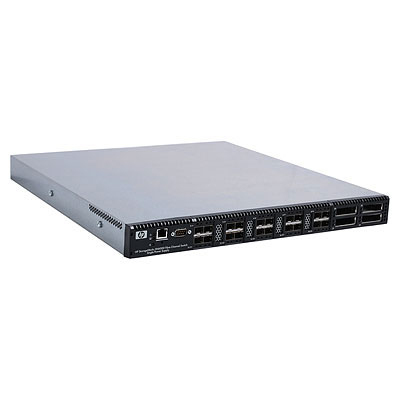 (4) High-speed 10 Gb/s linking ports upgradeable to 20Gb/s allow easy stacking of SN6000s. Included SAN Connection Manager (SCM) Software uses a simple topology view of the SAN to manage switches, HBAs and provision storage from a one screen. SCM plus HP Virtual Connect and HP VCEM simplifies SAN management for virtual server deployment in the Converged Infrastructure. Transparent Router offers non-disruptive access to servers and storage on HP B-series and C-series SANs. The SN6000 makes it easy to extend the solution lifespan while preserving investments. • 8 to 20 enabled 8 Gb/s ports (Single power supply) model, and 20 enabled 8 Gb/s ports (dual power supply) model for high availability. • Industry leading ASIC technology provides superior switching, less than 200ns latency, ensuring optimal performance in enterprise environments. • SAN Connection Manager (SCM), included with H-series, lets you deploy SAN infrastructure (SN6000, P6000/EVA, P2000/MSA, HBAs) and provision storage from a single screen. Enterprise Fabric Management Suite Software delivers affordable SAN management tools such as performance monitoring and more. • Unique feature for HP only. Transparent Router (TR) - Industry standard NPIV provides low cost expansion and connectivity with existing HP B-series and C-series fabrics and enables cost-effective SAN expansion with management simplicity.